You basically try to stay healthy in four key areas: Physically, Emotionally, Mentally, and Spiritually. 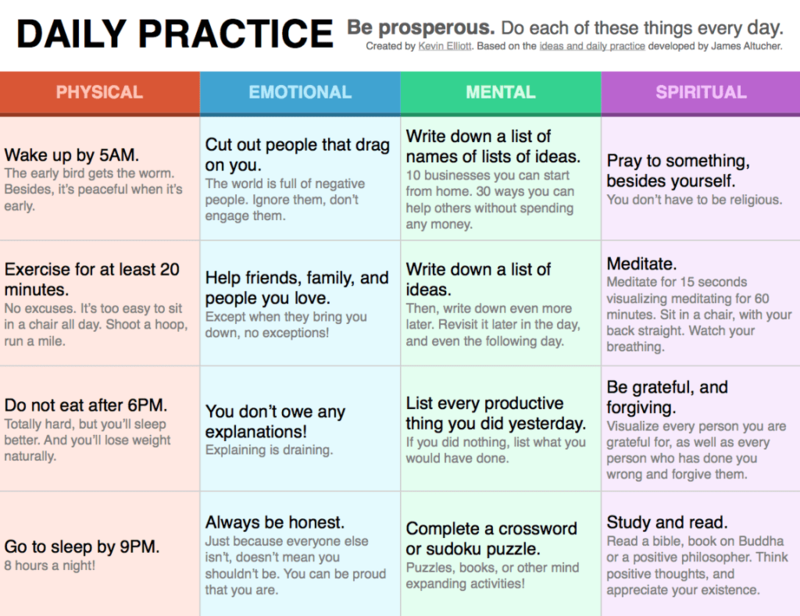 The chart above gives examples of things you can do every day to work the daily practice in your life. “I put emphasis on it because it’s the only thing that’s ever worked for me. Following that practice is the only thing that “unstuck” me, pulled me off the floor, saved my life, and actually propelled me to success.” James Altucher, Choose Yourself! If you can consistently work the daily practice every day then your life will completely change in 6 months. It’s worked for me and plenty of other people also. This is awesome, despite having broken at least two of the items on the Physical list this evening! l’m a big fan of capturing ideas as and when you get them, so they’re ready when you need them. Awesome, thanks for sharing, I will be getting a copy of this on my wall. I’m a big fan of capturing ideas also. Happy to hear you found this helpful. Cheers!